Developed and published by Numinous Games. Released on January 12, 2016. 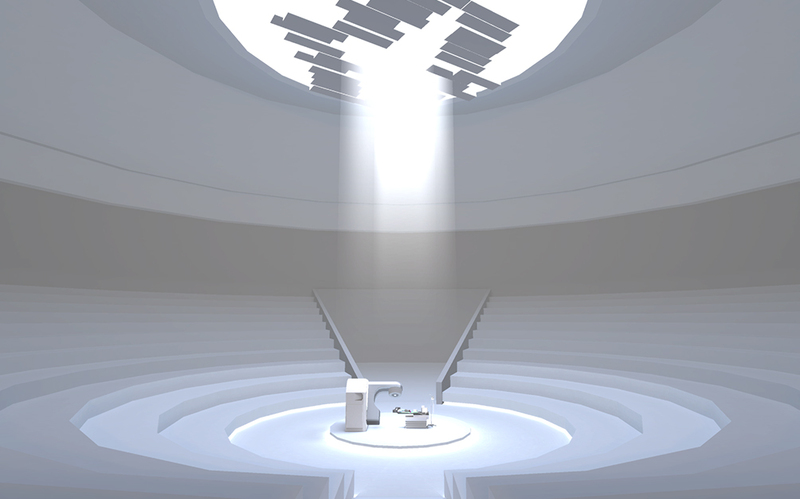 Available on PC (Reviewed), Mac, and Ouya. Review code provided by publisher. I want you to imagine and describe a brand new color. Something that has no basis in language, no real logical anchors to grasp hold and communicate, but I want you to try all the same. Reach into the quiet parts of your mind, and summon every word, thought, abstract concept, and comparison you can possibly put to form in order to conceptualize and describe something no one has ever seen before, and communicate it in a way that makes sense for others. It's a nigh-impossible thing to conceptualize, because it's such a difficult idea to keep traction on. Can colors even be conceptualized outside of having a frame of reference? It can't be like blue, green, or purple, because there are already blues, greens, and purples. It is, instead, something so theoretically simple but impossibly beyond reach. A thought process that has no frame of reference, and is difficult to communicate for that very reason. This is a thought exercise I come back to from time to time, in my own experience, when trying to describe why it's so difficult for me to communicate things sometimes. Uncertainty, fear, and anxiety are things we all face sometimes, but some more than others. For those who face it chronically, there almost isn't any language that does the feeling justice. It touches on aspects of it, elements of the worst of the feelings, but it's always just one step too removed to really hit all the right notes. 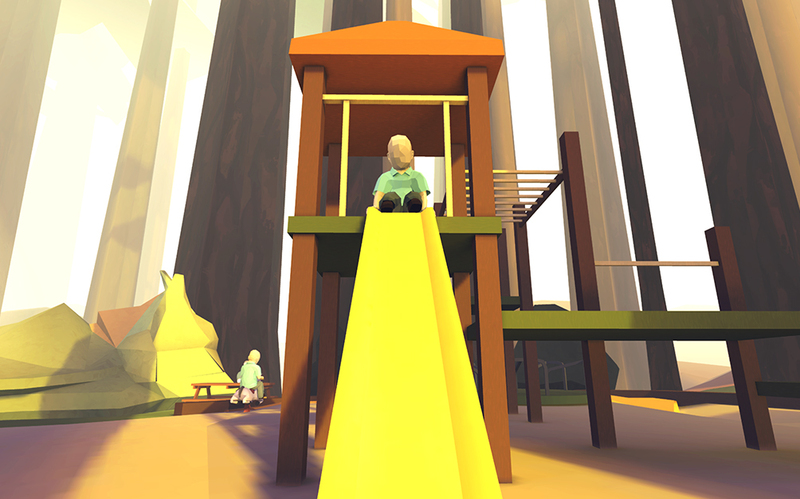 That Dragon, Cancer feels something like that concept, like one of the best descriptions of a new color I've ever experienced. 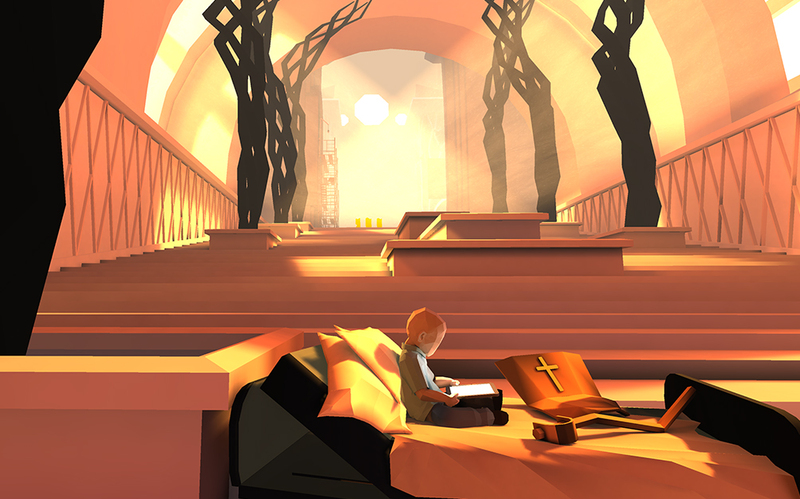 Buried in its text, in its audio, in its deliberately polygonal visual style, there is a beautiful work of art in communicating something that doesn't have words. 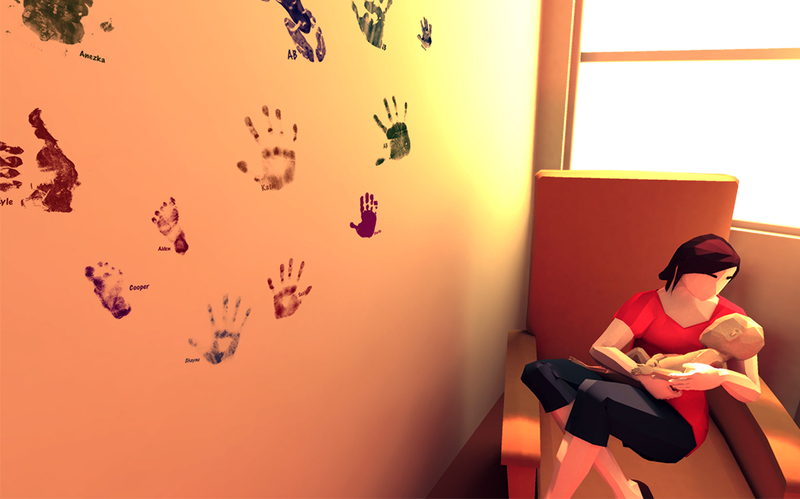 That Dragon, Cancer is a game about a boy fighting cancer, and about a couple clinging desperately to the hope that the fight isn't a losing one. 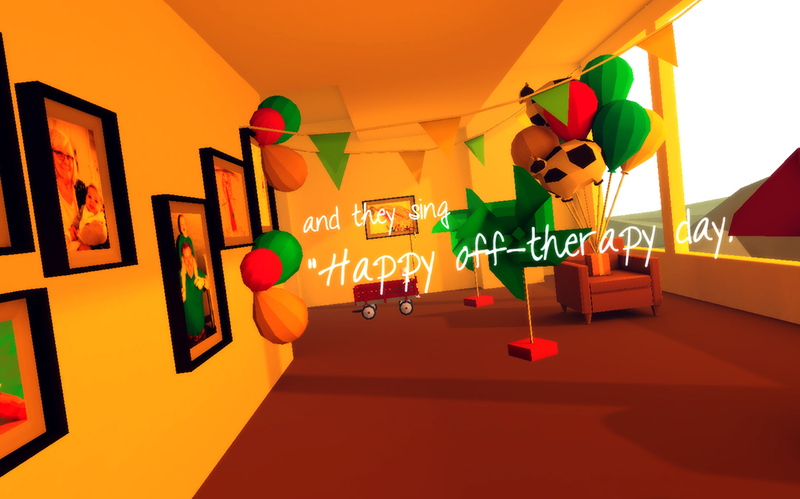 The game loosely connects small vignettes of life, stitched together with floating text, abstract symbology, and moments of emotional turmoil, all of which spiral around the struggles and anguishes of dealing with cancer. Each of these scenes has a new turn in Joel's life to communicate, and brings with them new visuals, new abstracts, new colors, and new struggles for the protagonists to have to face as the cancer plods steadily, endlessly forward. Although none of the scenes last for longer than ten or fifteen minutes at most, they each bring a tiny, emotional gauntlet of sensations, leaving over a staggering sense of uncertainty in their wake. None of the scenes are haltingly difficult to sit through, not by themselves, but each subsequent moment compounds on the last, passing in mere minutes but dragging forward with exaggerated slowness. The emotional turmoil occasionally leaves the narrative in a quagmire, not at all difficult but still hard to play. The struggle seems unending for Ryan and Amy, both parents facing one faltering step after another, yet still their words and thoughts paint the mood in every scene. They're never far away from the struggles, and by design, it felt a lot like the player wasn't meant to be either. There were no scenes that were exclusively uplifting, excepting perhaps the very first one, and the news only gets worse. 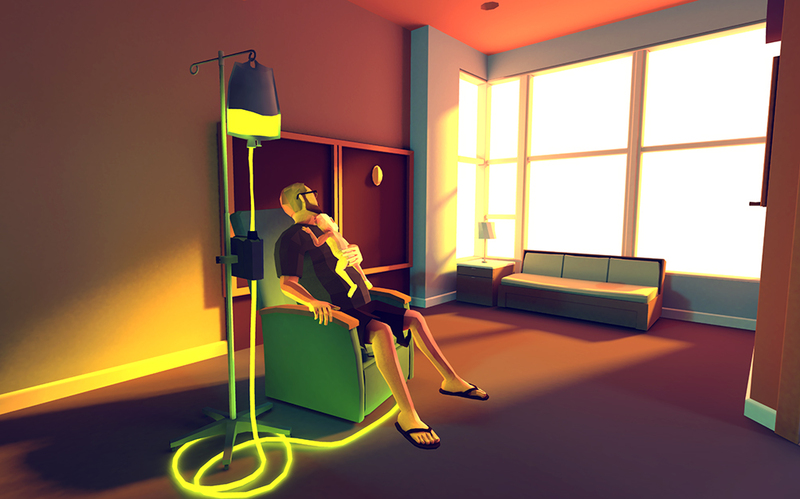 There's a scene early in the game, a tableau that is used in the game's cover art, of Ryan holding his young child Joel in his arms, while an IV of luminous, toxic yellow fluid stands ominously in the foreground. The room is otherwise unnaturally still, and the glow of the IV is the only significant light, glowing and impossible not to notice. As an emotional piece, That Dragon, Cancer manages to communicate the flinching uncertainty of a hospital waiting room. Hours upon hours of uncertainty condensed into a movie-length package, flocked on all sides by the unknowable future, and what terrible things it's hiding just beyond the next transition. However, as an art piece, it's imperfect. The symbols throughout the game seem to shift entirely at random, with the neon lights and color glows changing in conflict with the tone. The symbols of water and drowning appear regularly, but also occasionally to paint a moment's serenity, often in the same breath as the drowning. Both Ryan and Amy struggle in different ways, but they often seem like they're both pursuing entirely difficult struggles. They both favor completely different mediums, as well, giving them a bizarre sense of separation from each other, as if the other is facing a different abstract challenge. Mechanically, the game verges on being bad. 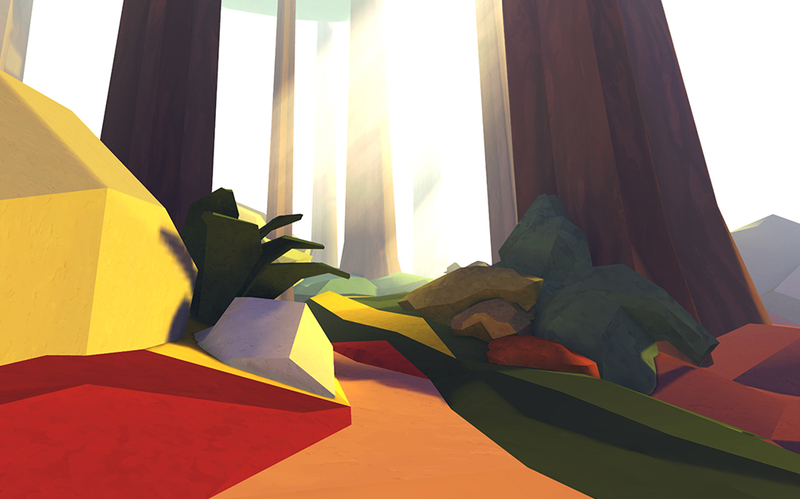 The navigation is muddy and unclear, without a strong, central guiding color or direction to travel, a lot of scenes will stumble and grind as the player has to find the new sense of direction that will take them where they need to go, with no real guidance on how to get there. Where there are mini-games, which there are, they are out of tone and seem to serve only to water down the emotional tension in pursuit of holding onto a more game-y audience that the game probably lost somewhere in the first twenty minutes, and leaves those looking for something else just grinding through the unnecessary acknowledge of videogame-esque mechanics just to get back to the story. 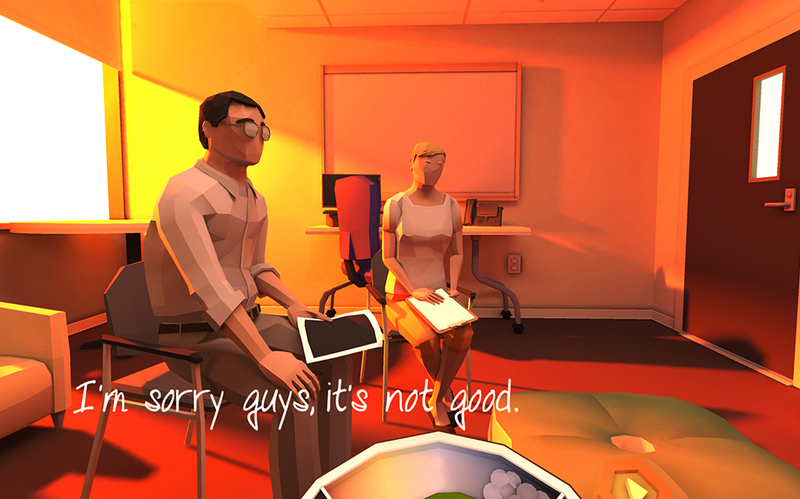 So, in a way, That Dragon, Cancer is a bad game, but it also isn't. It's an inconsistent and strangely disjointed experience, as if it's put together wrong, and is just dragging itself along as best it can forward. Which feels like Joel's journey, with every day a strange and difficult struggle to deal with all of the twists and turns that cancer comes with, and although it doesn't toddle along gracefully, it still surges forward as best it can. By the end, it's both a very brief window into Ryan and Amy's struggles as parents of a cancerous child, but also a very long slog through some of the hardest things a person can face in life. 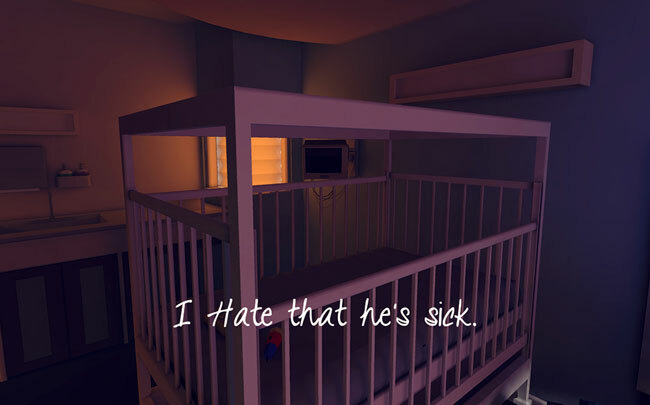 I think the most telling moment in the game is a scene toward the middle of the game in which the hospital - which is now a very familiar landscape for Ryan, Amy, Joel, and the player - that is strung up with cards. On each of these are messages written from Kickstarter backers, commemorating someone they lost to cancer, or someone who's survived a wave of it themselves and are expecting with concerned uncertainty that it will one day come back. Over a hundred cards in all, scattered throughout the hospital, each of them with a custom message of hope, of concern, of memory, each of them a hope for the future. 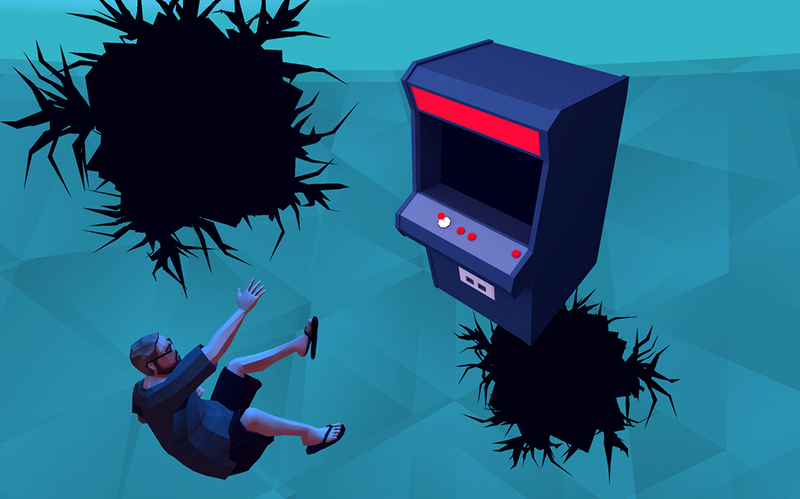 That Dragon, Cancer isn't a game for everyone. It can't be. However, anyone who's struggled through a hard fought battle with cancer probably knows that hallway full of cards very intimately, knows they aren't alone, and that their struggles are very real, very important, and almost impossible to explain it all to the world. Almost, but not entirely, impossible. 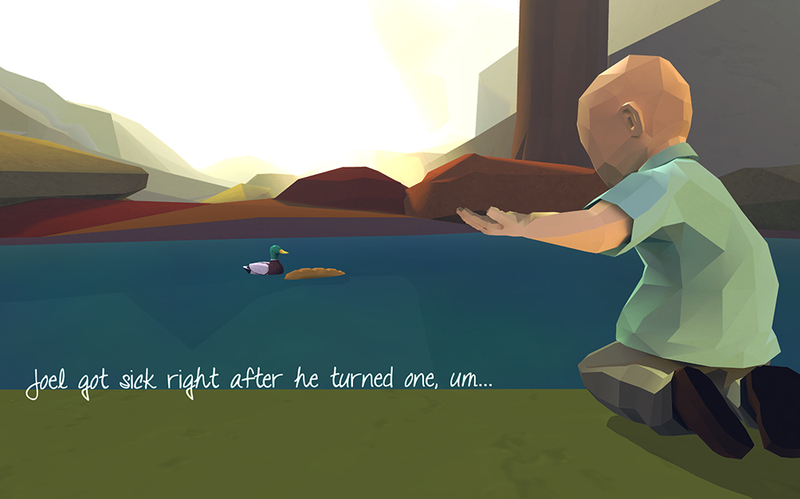 Bottom Line: Like inventing and describing a new color, That Dragon, Cancer tries to describe something indescribable, and does an admirable job of it. Recommendation: A hard game to play because it isn't fun, it often isn't relatable, and will occasionally bring with it tears and hard breaks. But it's an important game for some, and that's enough.